There is an updated list of his albums at MG Music and at All Music web pages. He produced albums on which he arranged, performed, mixed and mastered every song. Despite of that, his last album, Om (2006), was produced together with Terry Oldfield. According to Allmusic "Goodall began composing original songs as a teen, earning local notoriety with his band Trax; in the years to follow, he learned to play a vast range of instruments, including mandolin, piano, drums, harp, flute, glockenspiel, panpipes, vibraphone and synthesizer, and cut his first album at age 16". He his very prolific (he has recorded over 75 albums). He also topped the UK music charts twice and sold over three million albums. His first album was "Emergence" (1987), published by New World Music. His early albums were published also by Oreade Music. 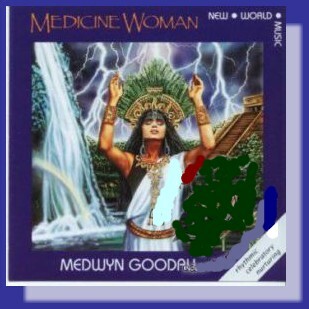 Medwyn Goodall recently started MG Music, a record label which specializes in New Age music. He lives with his wife Wendy in Cornwall, England. is a composer and musician mostly associated with the New Age genre. He was born in Yorkshire, England, in 1961. Medwyn používá tradiční hudební nástroje a rytmy, aby oslavil princip ženství. Jedině rovnováhou mezi základními principy můžeme dosáhnout harmonie. Živá autentická hra na latinskoamerické hudební nástroje .